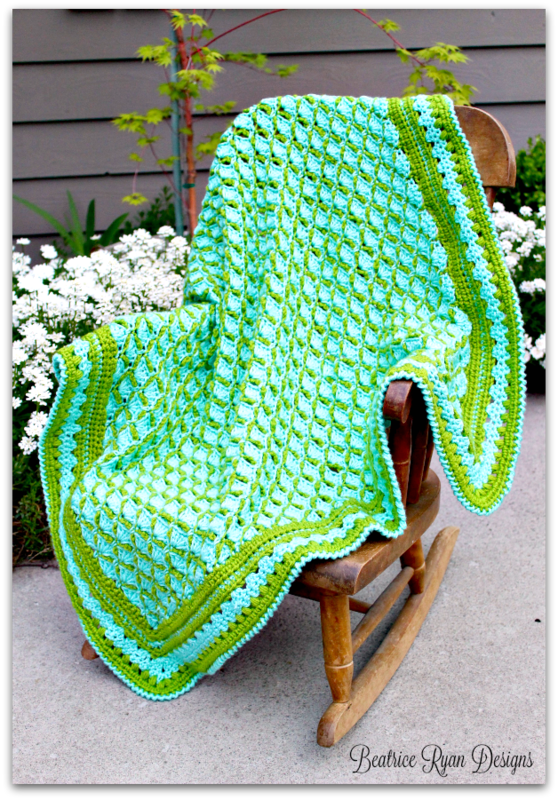 Frog Pond Baby Blanket… Free Crochet Pattern!! If you love this Free Crochet Pattern… Add it to your Ravelry favorites for easy access!! Click Here…. 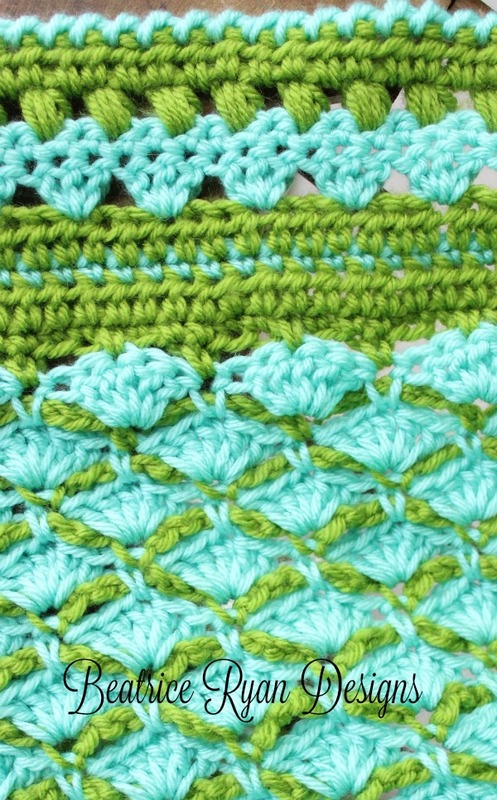 Frog Pond Baby Blanket is a fun, whimsical design that reminded me of a pond near my home with blue water, grass, algae, cat tails and willows… This multi-textrual blanket is a simple yet fascinating stitch pattern… I hope you will enjoy crocheting this project!! Shell ~ 3dc in same st or 5dc in same st.
Row 5: Join, ch 1, turn, sc in same st, *ch 6, sk shell, sc in next sc*, repeat * * across to end. Begin with Right Side Facing, join color A to the bottom right corner. Row 1: Ch 1, 3 sc in same st, sc 91 evenly across side rows to top corner, 3 sc in corner st, sc in next 3 sts/chs, sc around chain and into the top of the 3rd dc of shell from previous row, * sc in next 5 sts/chs, sc around chain and into the 3rd st of shell below*, repeat * * across, 3 sc in next corner, sc 91 evenly down next side rows, 3 sc in corner, Join to bottom corner. Row 9: Join in any st, reverse single crochet around. Join to beginning. I hope you have enjoyed making this pattern… lots of fun textural stitching!! 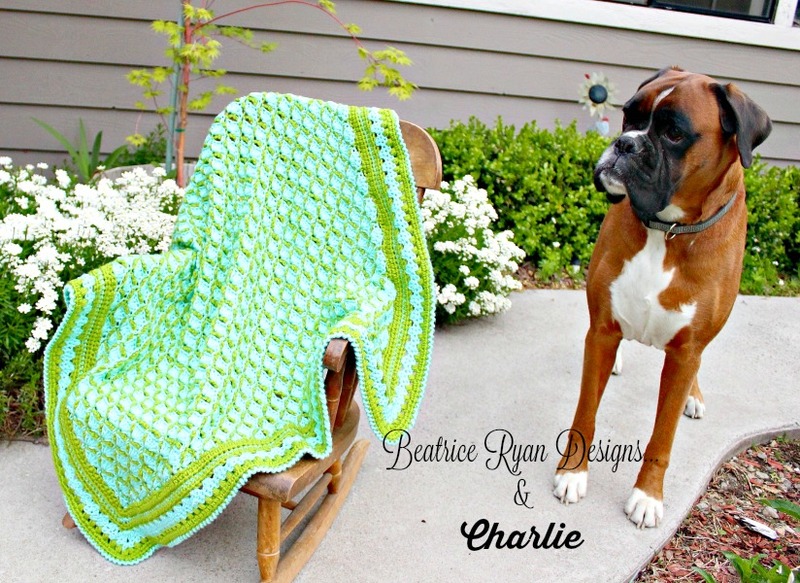 Please share your finished projects on my Beatrice Ryan Designs Facebook Page!! Just wanted to send you abig thank you for this lovely blantket. yours is the absolute best place to look, each and every pattern is so inticing, and i’ve loved making everything i’ve tried, several cals, several baby blankets, just great, no words to thank you enough, when i can figure out how to do it, i’ll send you some photos of what you’ve enabled me to create. Thank you so much… I will look forward to seeing your pictures! This stitch is gorgeous, beautiful blanket, thank you. That dog is gorgeous too! I’m so glad I discovered your site. So many lovely projects! I have a question about this project. Did you cut your yarn at each color change or bring it along? This is first blanket. I love the blanket so much that I’m inspired to try it. Thank you for sharing your talent. Thank you for the beautiful pattern!!! Is there a way to make it bigger? How can I change the base row? Love this! I’m pretty new a crocheting so I apologize in advance for my question in advance. On row 2, when you join color b I don’t know what this means to (sl st across to the middle st of corner). I am going to try and make this for my little sister who is expecting her first baby the end of December. I look forward to hearing from you. Thank you so much. 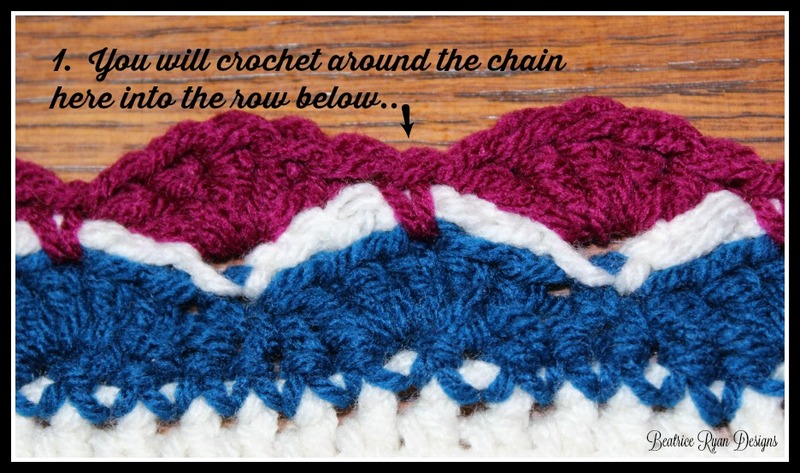 Have a question – For the blanket Row 2 – It says Chain 3 and then turn. Where do you connect the chain 3? Did I miss something? what a beautiful pattern. it’s so funny that i am making this frog pond blanket for my niece who just moved to New Zealand and you have Kiwi in your instructions. is that the color or a new stitch? she wants gray black and white instead so i will send you a snap shot of this when it’s done (if i can figure out how to send it). thanks so much though for sharing your wonderful talents. I totally love this patter but got confused right out – row two says chain 3 – i had already attached the new color, because otherwise it would have been the wrong color in that row – no? then it says join – joining is the second color. did i do it right? i don’t want to keep going unless i am doing it right. please advise. thanks so much. you really do hve the nicest designs. i absolutely love them. When changing colors.. I pull it through the last part of the stitch in the row of the previous color or join it and do the ch 3. If I want to make the frog pond pattern larger, would it work to just start with double the initial chain to 181? it is a 6 stitch repeat, so do inrements of 6, you will have to compensate the border. Also, the picture seems to switch colors between rows 6 and 7 of the edging but the pattern doesn’t mention that.